In 1960, Eberhard & Co. presented an automatic chronograph that would become an emblem of its era thanks to its innovative attributes combined with remarkable precision: the Contograf. Over the years, its twin counters, its broad instant-jump date window, as well as its water-resistant pushers have established the watch as an indispensable daily companion. 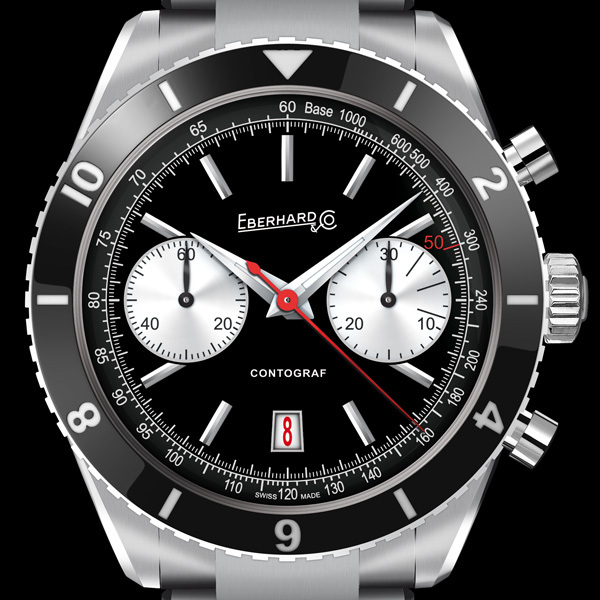 Eberhard & Co. now celebrates this legendary chronograph through a new Contograf. While most of the original identity codes have been preserved, such as the minutes counter also measuring the phone clicks that used to occur every three minutes in the 1960s, vintage details rub shoulders with some interesting novelties. 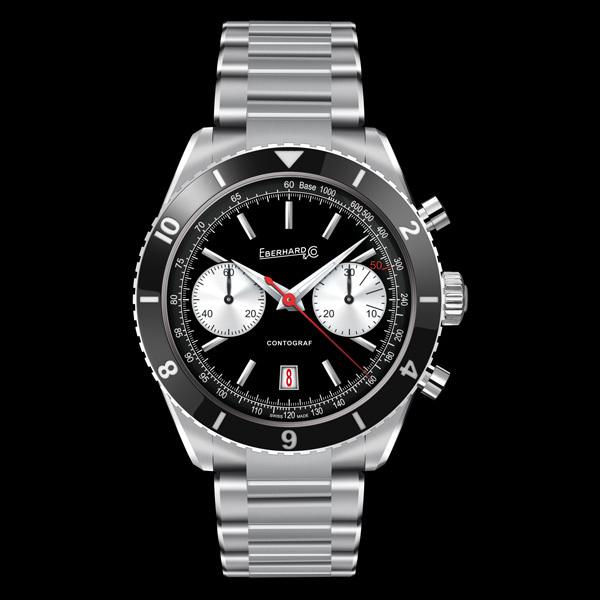 The Contograf 2014 is thus equipped with an elegant ceramic rotating bezel as well as the Chassis® metal bracelet completed with its patented Déclic folding clasp. 2 counters (30 chronographer’s minutes at 3 hours – small seconds at 9 hours). Rapid-adjustment date at 6 hours. Central hand for the chronographer’s seconds. Bezel: steel base with outer toothing, insert in black/anthracite with numbering, small indexes of the hours scale and triangle at 12hours, engraved, palladium treated. 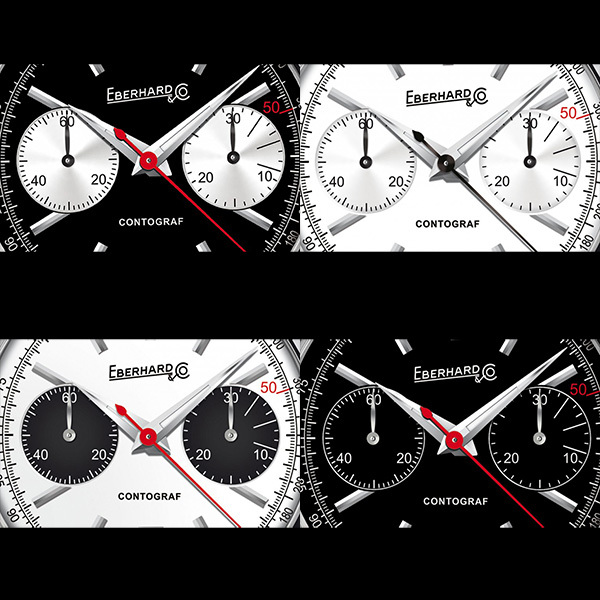 Dials: white, black, black with white counters, white with black counters, 9 applied indexes, faceted. Date window at 6 hours with a particular trapezoidal shape and applied profile, red numbering. All these elements have been maintained from the 1960s model. Counter of the chronographer’s minutes at 3 hours with the addition of a 3 minutes lapse counter, a feature of the 1960s to control telephone calls timing. Strap: black leather with “red arrow” detail. Bracelet: Chassis®, in steel - 3 links: the internal one is satin while the other two are polished.